We just have signed a cooperation agreement with The Sea Factory od the Basques Albaola to supply them every clamping tools they need. The main goal of Albaola is to build a historical replica of the San Juan, a whaling ship built in the 16th century in the same port where they are located now (Pasajes San Juan, Guipuzcoa) You can see it right before your eyes! This project tries to recover the traditional basque shipbuilding techniques in woodworking. That is a hit in heritage preservation and divulgation which is becoming more and more relevant. It recently received the support of UNESCO World Heritage Site which gives it the highest level in the field of safeguarding maritime heritage. The Aprendiztegi School, International Carpentry School of Ribera Lance Lee, has also been launched since September 2017, with the aim of transmitting this shipbuilding knowledge. PIHER is a company associated with the Economy of the Common Good for a market system for collective benefit and cooperation. That is why Piher shares the goals of Albaola collaborating, as far as possible, in the development of its environment, supporting those projects that suppose a genuine added value in culture, education or equality. PIHER has decided to collaborate with this project because its uniqueness. Also because the use of the highest level and rigor of the field of carpentry tools in general and clamping in particular, both in the traditional carpentry school and the San Juan whaling ship . The San Juan whaleship of the sixteenth century was the result of a technological and industrial network that made possible the construction of these large transoceanic ships. Its current reconstruction is also a unique opportunity to highlight these tools and methods of work. The Aprendiztegi school in Albaola aims to transmit this knowledge, in which the use of this type of tools occupies an essential place. The agreement was formalized in the Basque Maritime Factory with the assistance of PIHER of Carlos and José Piqueras, sons of the founders of the company, and of Xabier Agote by Albaola. 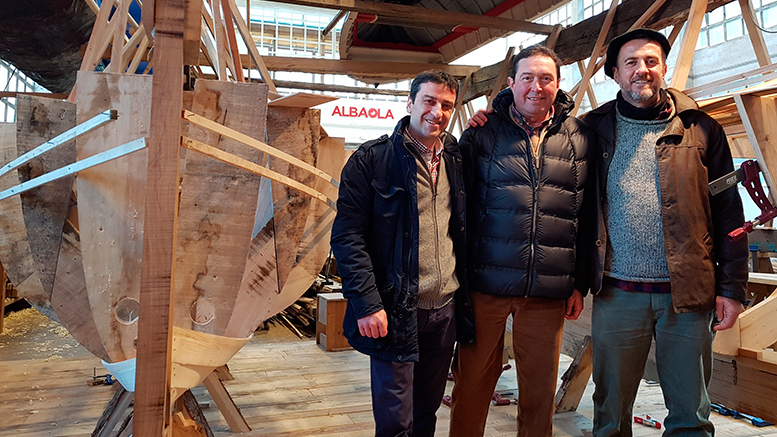 Thanks to this agreement with Albaola, PIHER gets recognition for his quality values and the innovation in clamping tools design in the best way possible: by collaborating with a project that works hard for the international relevance of the local heritage. on "Piher becomes the Clamping Tools official supplier of ALBAOLA project"